Missing outcome data are commonly encountered in clinical trials and may compromise the validity of the estimat ed treatment effects. Meta-analysts typically assume that the missing data problem has been solved at the meta-analysis level and conduct an available case analysis. However, bias from missing outcome data is accumulated in a synthesis of those trials using meta-analysis. 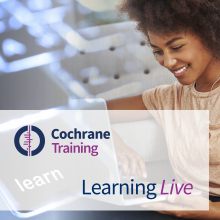 In these videos, originally part of the Cochrane Learning Live webinar series, Dimitris Mavridis and Anna Chaimani present methods for estimating meta-analytic summary treatment effects when some outcome data are missing by using a statistical (pattern mixture) model to allow for uncertainty in the missing information. They quantify the degree of departure from the MAR assumption by introducing an informative parameter that relate the outcome in the missing data to that in the observed. That parameter is not informed by the data and they resort to expert opinion to inform or conduct a sensitivity analysis. They present a Stata command that applies the suggested methodology i) for both dichotomous and continuous outcomes ii) for pairwise and network meta-analysis. They then illustrate the method using examples from mental health trials where outcome data are rarely missing at random (MAR). The webinar was delivered in June 2018. Below you will find videos from the webinar, together with accompanying slides to download [PDF]. Dimitris Mavridis, Department of Primary Education, University of Ioannina, Ioannina, Greece. Anna Chaimani, Centre de Recherche Épidémiologie et Statistique Sorbonne Paris Cité (CRESS-UMR1153), Inserm / Université Paris Descartes.